Why Walnut Blasting BMW N54 & N55 is a MUST Before Tuning – Now Available at ModAuto! What is Walnut Blasting? Why should I do it? Well, don’t literally put walnuts in your intake, but we’re talking about Walnut Shell Blasting your BMW N54 or N55 BMW E90 335i, E92 335i, F30 335i or F32 435i – though what we’re about to say probably applies just as much to the S55 of the all new F80 BMW M3 and F82 BMW M4. While it sounds absurd, your dealer actually recommends you do this every 30,000 miles! UPDATE! We had the chance to perform the Walnut Blasting service on Senior Mod Expert Alan Wei’s own E92 BMW 335i – a service now available at ModBargains’ Install shop, Mod Auto! We’re offering introductory pricing of just $495 – supplies alone to do it yourself would cost you $410 – and that’s before you even get to all the labor of removing your entire intake system and intake manifold! Save the headache and let us do it for you. Why does BMW recommend Walnut Blasting your N54 every 30,000 miles? Well, that has to do with your fuel system – and much like dirty injectors or a dirty Mass Air Sensor can cause poor MPG and sluggish performance in earlier EFI cars, your N54’s intake system needs to be cleaned regularly to perform at its peak. Not only does the dealer recommend that you perform this service every 30,000 miles, Cobb Tuning, Burger Motorsport and nearly every other BMW tuner we’ve run across all agree- for best results, your motor should have been recently been cleaned using Walnut Blasting before you crank up the boost or do a dyno run – make an appointment to have your walnut blasting service today to ensure you’re ready for upgrades. This is is an actual photo of how Mod Expert Alan Wei’s N54 looked after 70,000 miles. Isn’t that a disgusting mess? What’s more alarming is that YOUR INTAKE VALVES PROBABLY LOOK JUST AS NASTY! DO SOMETHING ABOUT IT. Make an appointment. This is the OEM intercooler off of a 2007 BMW 335i – we actually had to put a cup under the OEM intercooler to collect all the oil to keep it from making a mess of the shop. See how the entire intercooler has a nasty yellowish green sheen to it? That’s OIL. And that’s why your intake gets as disgusting as it is. God, that’s nasty. And to think, the inside of your intercooler likely looks JUST LIKE THIS! Modern engines like the N54 and N55 family of engines feature Direct Injection fuel systems- traditionally, in a multi-point fuel injection system, you’ve got your fuel injector mounted in the intake runners, which sprays down the inside of the intake valves and intake manifold runners with gasoline, continually bathing them in gas (an excellent cleaner) and which keeps them clean and flowing smoothly. It’s not just BMW using direct injection– most modern engines feature some version of direct injection, and notably Ford EcoBoost engines also employ the technology. This is an illustration of a classic Port Fuel Injection system. Notice that the fuel injector is mounted ahead of the intake valve. 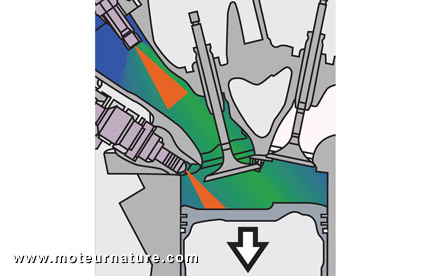 This is an illustration of a Direct Injection system for comparison – you can see the intake valves, but now you’ll notice the injector has been moved inside the cylinder itself. What this means is that with the advent of direct injection which moves the injector further ahead of the intake valve and runners, the valves are no longer getting cleaned by the gasoline spray of the injector, meaning that dirt, oil and other gunk is free to accumulate. Even a healthy N54 will have quite a bit of oil blow-by in the intake system if you do not have an Oil Catch Can system fitted, which can cause a significant amount of carbon gunk buildup inside your intake runners. Performing a Walnut Blasting De-Carbon service really isn’t that hard, and with the proper tools and training, it can easily be done yourself. Using a walnut media blaster and a few specialty tools, you’ll have your intake runners clean enough to eat off of in no time. Take a look at this before and after that clearly illustrates the difference – considering how nasty these motors were, how clean is yours? Schedule your Walnut Blasting Intake Cleaning Service today. So, with your engine intake valves and runners clean, what will you end up feeling in the driver’s seat? Better throttle response, fuel economy and more overall power are all benefits of having a clean running engine. After performing the Walnut Blasting service on Mod Expert Alan Wei’s N54, the car immediately sounded much healthier the first time we fired it back up. And here’s an actual photo of Alan’s motor right after doing the service. You can actually see the valve now! Having seen the before and after shots and the fact that it is recommended by BMW every 30k, it’s worth mentioning that though it is recommended it is not included as a part of your average service plan, and most reputable tuners such as Cobb Tuning will ask that you have your intake walnut blasted before bringing in your BMW for dyno tuning, so we’re not just blowing hot air up your tailpipe here. So keep your engine happy and clean- walnut media blast before tuning, and help keep it clean with an Oil Catch Can to minimize the amount of oil vapor that can get into the intake system. Interested in learning more about modifying your N54 or N55? Check out these great articles on BMW N54 mods and BMW N55 mods. Whether you want to just get another 20hp out of your 335i or you want to turn it into a fire-breathing beast, you can count on expert advice from the Mod Experts atModBargains. Call 714-582-3330 today to speak to one of our enthusiastic experts today. ModBargains now offers Walnut Media blasting service at our install shop, Mod Auto – for a limited time, we’re offering this service for just $395 – it’d cost you $410 in materials/tools alone to do it yourself. Save yourself an afternoon and let our professional Technicians clean out your intake valves to make your N54 as snappy as the day it left the factory again. Take advantage of this pricing while it’s available – call us today at 714-582-3330 to schedule your Walnut Blasting BMW Engine Cleaning Service today, and we invite you to talk to Senior Mod Expert Alan Wei to hear about the difference it made in his car first hand at x8006. Do you really recommend to do walnut blasting even on a n55 engine?